Paul leads all aspects of constructing your project whether it's milling the wood in our shop, or installing your custom cabinets. 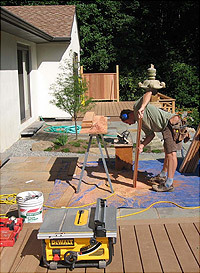 Paul has been a woodworker and managing residential construction projects for over 23 years. He began Paul's Woodshop in the spring of 2003. From start to finish, Paul & Lisa, the operators of Paul's Woodshop, are the staff you will see working on your project daily. Our team is ready to work with your family. Lisa's background includes 18 years of commercial architecture experience. Lisa partnered with Paul to grow Paul's Woodshop in 2005. Lisa manages the design & office operations of Paul's Woodshop.